Learning to Read | Picture This! How much do you think about your ability to read? Do you ever consciously notice how much you use this skill just to function in everyday life? What if it were difficult to understand what was going on around you because you lacked this ability? How would that affect your independence, your choices, and your overall quality of life? 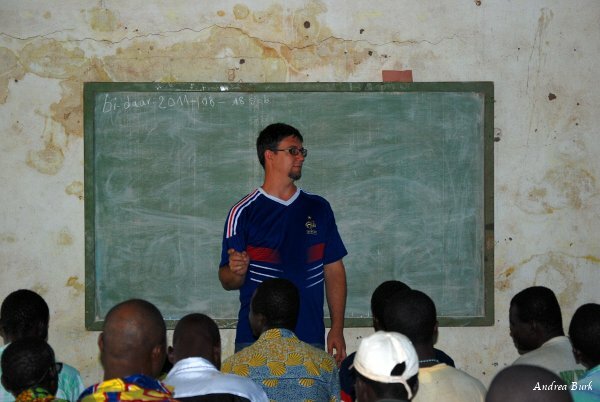 As we discussed in my last post, the education system in Burkina Faso is making reforms and changing for the better. That, however, is the future; the literacy rates of Burkina reflect the facts of the past. According to the United Nations Development Program (UNDP), 71.3% of the Burkinabe people 15 years old and older are illiterate. Church leaders who can already read come together for a seminar on how to teach others to read. One can imagine the effects this has on the economy and Burkina’s ability to interact on an international level. Self-esteem can be low, and having goals for one’s life is not even in a person’s thoughts or worldview. Many times people will learn just enough to be able to function in the market place, but can only manage money on a small scale. It would be too easy for someone to take advantage of them when finances get so complex that they need to be written down. A lot of people still use their own special “X” or some other unique mark to sign things. The class reading the literacy materials. There are also major effects on the way our ministry here can be done. There are usually only 2-3 people or often only one person in a village who can read well enough to read and teach Bible stories. It has happened sometimes that the one reader has to move away in search of better job opportunities, leaving the church without a good way to access stories from the Bible. This also leads to somewhat younger people becoming the leaders instead of the elderly, normally accepted leader in this culture. Where the wisdom of age is lacking, there may be an opportunity for mistakes or abuses of power to occur. At the very least, it is difficult to have a deep Bible study if only one person has read the text. If that person missed something in the reading, there is no one to notice and get the group on the right track. 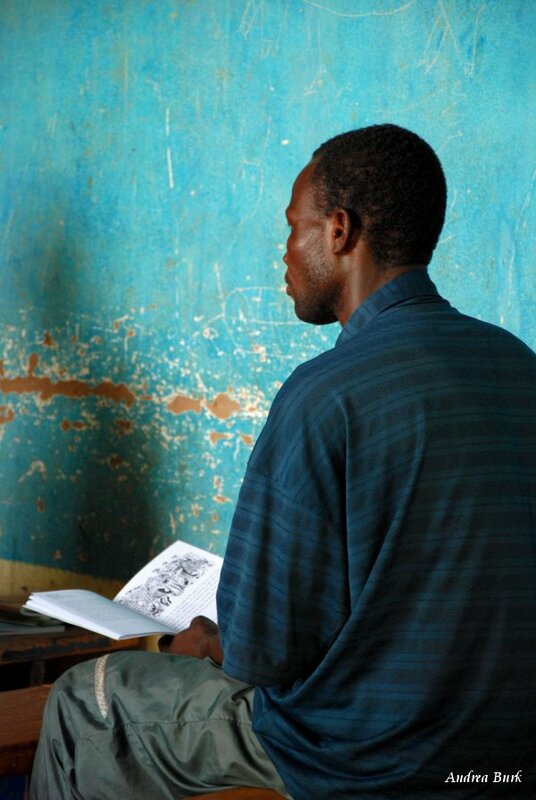 The government of Burkina has had an adult literacy program for a long time. There are also other organizations whose main goal is literacy work. Each of these has their books and their methods. So people are trying; however, there are some difficulties. One involves the weather patterns which I discussed in my first post. During planting and harvesting times, it is not possible to gather enough people to have a class. They are all out working in their fields, needing every available person to get the job done. So it is during the dry season when it’s too hot to grow anything on a large scale that these programs are in full force. Another problem is in some of the materials themselves. Some of the books have typos and mistakes, so the teacher has to be aware and not teach the wrong thing. There is also the issue I touched on earlier in that people who have never been to school, or didn’t do well, have neither a high enough self-esteem nor high enough expectations for life itself to be motivated to go to the class all the time and do their best. People are absent a lot and therefore not consistent in their learning. Aaron teaching in a rented house (for the week), using a borrowed chalkboard. Although there are already programs available, there is still plenty of room for more. As a part of our team’s overall goals for helping churches grow stronger, we have begun a program of literacy classes with a goal of being able to study the Bible. Some may know how to read, but they may still not know how to teach, especially with a Christian attitude of serving and humility. This is a result of the school system here being very harsh, using a method of punishment and shame instead of encouragement. Also, as well as learning small things like how to make a class list and keep an attendance booklet, they learn an inductive method of studying the Bible together. Aaron reading a story from the Dagara kids' Bible to literacy teachers. 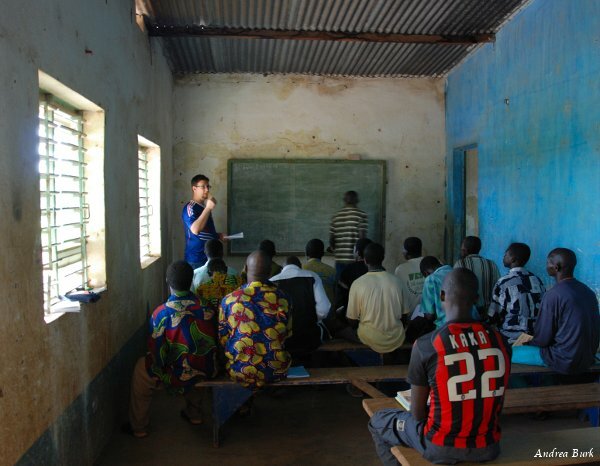 In August we had the first seminar which trained a class of 24 readers to teach others in their village to read. These 24 men can now go out and start classes of 30 each in their villages. When those people can read, they can then learn how to teach by attending a seminar and then reach even more villages. 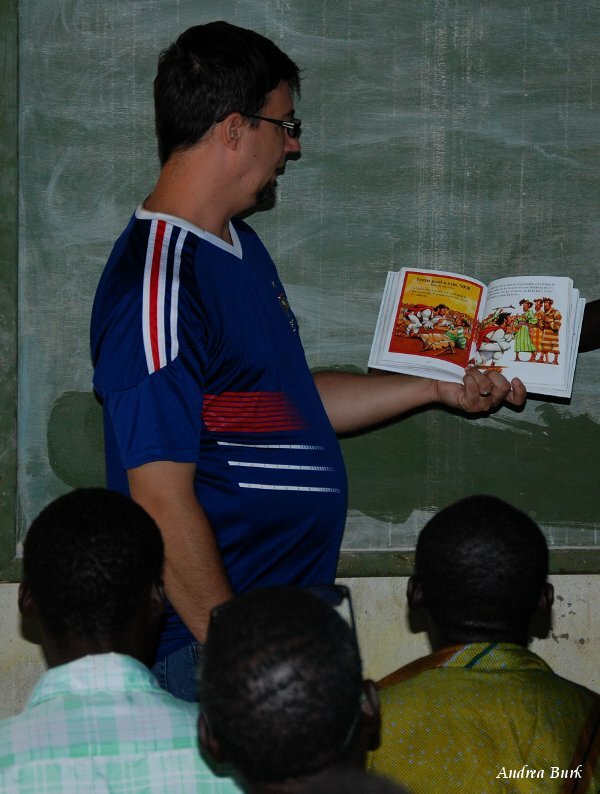 When each teacher has started his class, he gets a gift of a kids’ Bible translated into Dagara, which he can use to help motivate the church to want to learn and practice. By teaching a person to read, you can open up a whole new world of opportunities and knowledge to him or her. You give him the tools not only to understand more about God, others, and how to function in the world, but also the tools to help others. What do you think? Have you seen firsthand the effects of illiteracy? Could you do your job if you couldn’t read? What is the illiteracy rate in your country, in your city? Posted on November 18, 2011, in Uncategorized. Bookmark the permalink. 1 Comment. Thanks for writing a post about something that is obviously so near and dear to my heart.